Green bean casserole cups are a handheld alternative to the favorite holiday dish. The classic casserole ingredients including crunchy and crisp green beans, cream of mushroom soup, cheddar cheese and French fried onions are stuffed into uncooked biscuit dough. The end result is fluffy buttery biscuits contrasted by the rich filling. While this recipe was originally written to feature green bean casserole, you can certainly modify it to accommodate other fillings like creamed onion casserole or chicken and mushroom casserole. Also, is mushrooms aren't your thing, swap out the cream of mushroom soup for cream of celery, cream of cheddar cheeseor cream of chicken soup. Either option will be tasty. 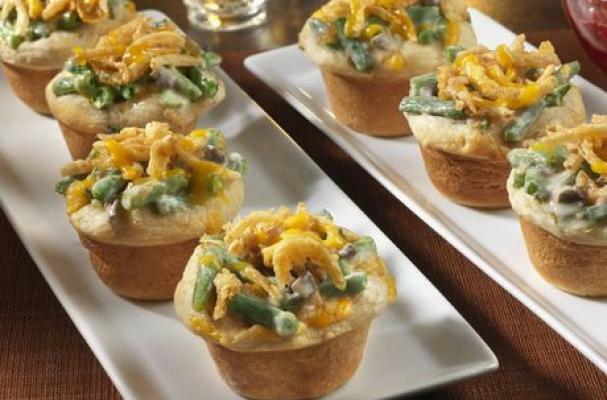 Bite sized green bean casserole cups are a unique way to present this must-have side dish. Step 1: Heat the oven to 375°F. Spray 16 (2 1/2-inch) muffin-pan cups with vegetable cooking spray. Stir the green beans, soup, milk, 1 cup cheese and 2/3 cup onions in a large bowl. Step 2: Roll each biscuit into a 4-inch circle. Press the biscuit circles into the bottoms and up the sides of the muffin-pan cups. Divide the green bean mixture among the biscuit cups. Step 3: Bake for 20 minutes or until the biscuit cups are golden brown. Stir the remaining cheese and onions in a small bowl. Sprinkle over the green bean mixture. Step 4: Bake for 5 minutes or until the cheese is melted. Let the minis cool in the pans on wire racks for 5 minutes.